Short ribs are a popular cut of beef. Beef short ribs are larger and usually more tender and meatier than their pork counterpart, pork spare ribs. Short ribs are cut from the chuck and plate primals. A full slab of short ribs is typically about 10 inches square, ranges from 3-5 inches thick, and contains three or four ribs, intercostal muscle and tendon, and a layer of boneless meat and fat which is thick on one end of the slab and thins down to almost nothing on the other. There are a variety of ways to butcher short ribs. The ribs can be separated and cut into short lengths (typically about 2 inches long), called an "English cut", "flanken cut" across the bones (typically about 1/2 inch thick), or cut into boneless steaks (a style recently introduced in the U.S.A. as a cheaper alternative to rib steak). In Korea, short lengths of rib are often further butchered by butterflying (or using an accordion cut) to unfurl the meat into a long ribbon trailing from the bone, or the meat can be removed from the bone entirely and cut into thin (1/4-1/8 inch thick) slices. Short ribs may be long-cooked, as in pot-au-feu, a classic of French cuisine, or rapidly seared or grilled, as in Korean cuisine, in which short ribs (called Galbi), are marinated and grilled over charcoal. A specific type from Hawaii is known as Maui-style Ribs. Other popular preparations are barbecue and braising. 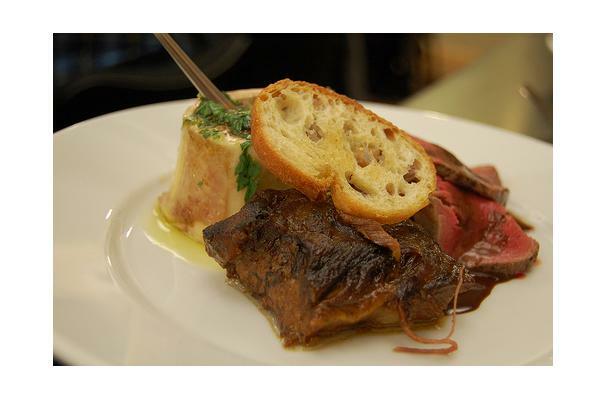 Choosing: The first thing you want to do is to choose the cut of Beef Short Rib you would like to prepare. There are actually two different cuts. The first is the long slender/thinner cut. The second is the thick cut which looks more like a cube. Either is fine. Obviously the thicker cut will have more meat. In the end, either will work fine but it really depends on your recipe. Buying: Buying short ribs these days are easy. You can get your fresh short ribs from your local meat shop or your nearest supermarket. Procuring: In southern regions of the United States, wild Boar can be hunted and butchered. Ribs can be cooked a couple of different ways. 1. In a crock pot 2. in the oven 3. On a barbecue. Either start cooking them plain or you can season them prior to cooking. All methods use indirect heat..."low and slow" as the term goes. In a crock pot...plan on 8 hours on the low setting. Cleaning: wash your meat thoroughly with running water. You don't want to remove too much of the fat from the meat. This is where you will get your juiciness. Be sure to wash/sanitize your hands after handling any raw meats. Uncooked ribs can be stored refrigerated. Follow the recommended expiration date. They may also be stored frozen for up to three months. Freezing however can destroy flavor and texture. Cooked ribs should be eaten immediately. Ribs have become associated with Southern food and family experiences. Highly popular for back yard barbecues and family gatherings. It is also a popular food for rib cook-offs and competitions. WARNING: If you are with a vegetarian or vegan or PETA member...eating ribs may be offensive or disturbing to some people.